After Lhasa, you will drive along the friendship road towards Nepal border. The snaky road along the patchy terrain offer excellent view of Himalayan peaks including Mt. Everest, Cho-oyu, Xisapangma and many others from the northern side. The towns you encounter on the way serve as historic sites and home of cultural heritage of this overwhelming Himalayan Kingdom. 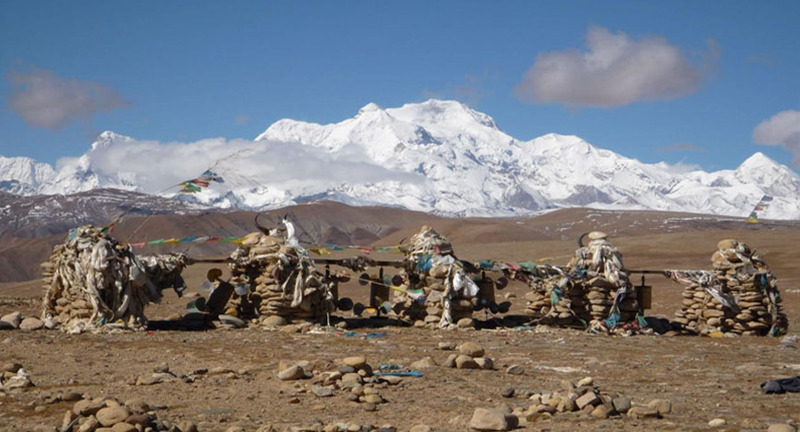 The tour ends at the border ofNepal-Tibet at small town of Zangmu where you will say good bye to your Tibetan staff and be welcomed by Nepali staff before culminating your trip in Kathmandu. DAY 01st: Kathmandu - Lhasa (3650M) Fly on china southwest airlines. Day 03rd: Drepung and Sera monastery. Day O4th: Drive from Lhasa to Gyantse (3950m) - 259km. Day 05th day: Gyantse- Xigatse (3900m) 90km. After breakfast visit Khumbum Stupa, Phalkar Monastery in Gyantse. After lunch embark on a pleasant 2 hrs drive to Xigatse. Second biggest city of Tibet. In the evening explore Xigatse. Overnight in Xigatse. Morning visit the place of famous Tasilumpo monastery and seat of Panchan Lama until his death in 1989 with its huge thanka wall, which is clearly visible from north side of road. Enroute visit Sakya monastery, if road condition is good. The monastery is 26 km off from main road. It is one of the oldest and most important Bonpo Monasteries of Tibet. Over night in Lhatse.